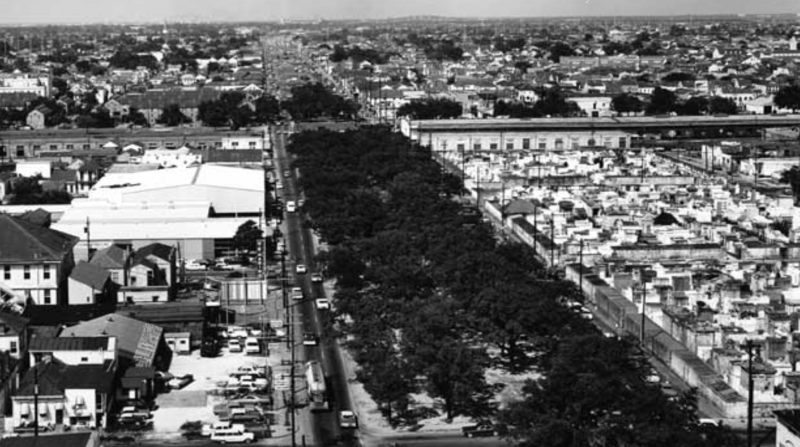 North Claiborne Avenue was once the heart of the Tremé neighborhood in New Orleans. 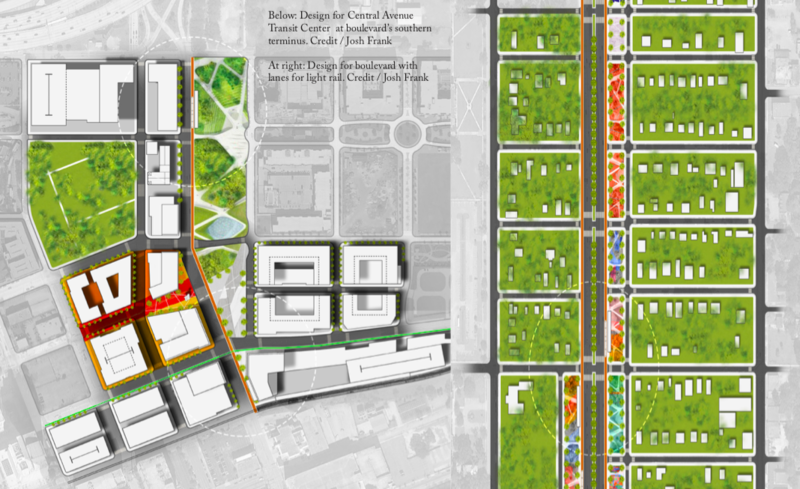 A vibrant commercial corridor with a wide, shady median, it was a key shopping and gathering place for the neighborhood in the early part of the last century. 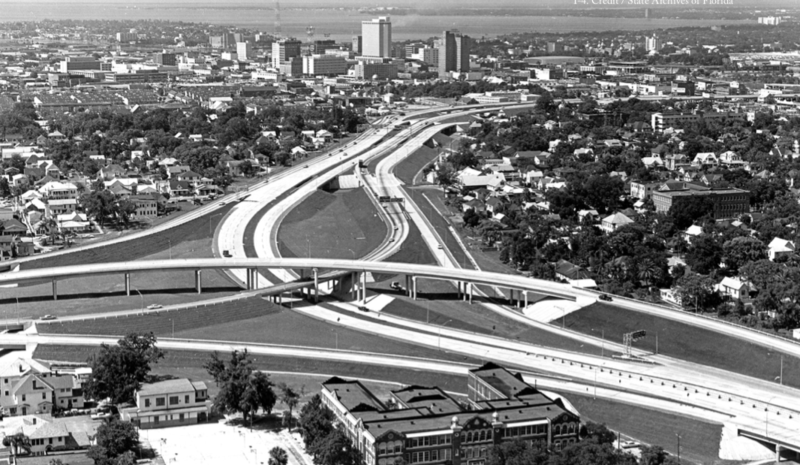 But all that changed in the 1960s, when the whole street was torn up and replaced with an elevated highway: the Claiborne Expressway. Today it remains, aging, but lording over the neighborhood and others, contributing to high air pollution and contributing to a food desert by eliminating a broad avenue once flanked by shopping. But now there’s hope. A group of residents and business owners is pushing for the highway to be torn down and converted to a street-level boulevard and affordable housing. Tearing down highways — specially elevated ones like the Claiborne Expressway — is something of a trend in the U.S. According to the Congress of New Urbanism, 17 cities, including Rochester, Milwaukee and San Francisco, have either committed to, or torn down, freeways since the 1980s. Tearing them down opens up valuable urban land, saves money and promotes alternatives to long highway commutes, like walking and transit. “Replacing these facilities, many at the end of their useful lives, is often neither feasible nor an efficient use of public funds,” said the group in a press release. Rochester provides a solid example: The city took a former trench called the Inner Loop Highway and partly filled it in as part of a conversion to a surface road and development sites (which are under development, see below). Another highway singled out for elimination this year is Tampa’s Interstate 275. When this 11-mile highway was constructed in the mid-1960s it “split the city in half,” according to the group. Central Park — “the Harlem of the South” — and Ybor City, rich historically black and cuban neighborhoods, were badly undermined by its construction. Rebuilding the aging the highway would cost $3-$9 billion by some estimates. 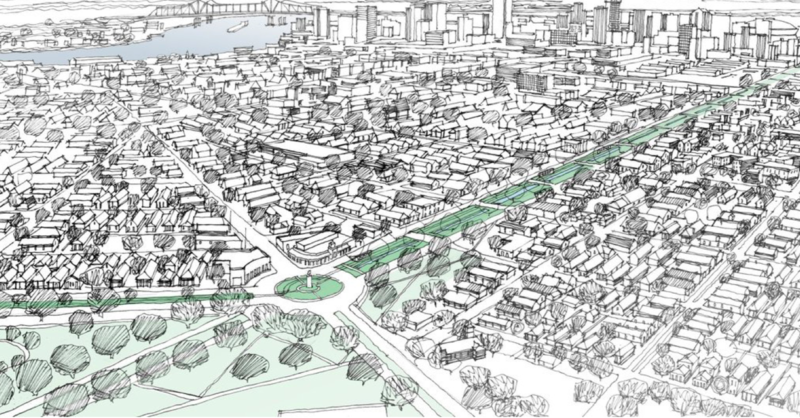 Instead, a group of locals led by designer Josh Frank has proposed an alternative: #blvdtampa — an at-grade boulevard that would rebuild the street grid and make way for light rail or bus rapid transit. Florida DOT recently agreed to consider the boulevard plan as an alternative. Not only would it be much less expensive than a highway rebuild, it would create 35 acres of developable land in Tampa’s urban core. Frank imagines it being served by either light rail or bus rapid transit. A number of prominent politicians support the proposal, according to CNU. Lake Shore Drive in Chicago really needs to be on the list! It’s a highway in everything but name and bisects the city from its best asset, the lake. It needs to go. I’m glad the Minnesota Freeway in Portland made the list. LSD is Chicagos version of Manhattans Westside Hwy or FDR. yes a large section of the Westside hwy was turned into a blvd and so is sections of Lake Shore Drive. the question is where are you going to put the tens of thousands of vehicles that pass through there during the morning and afternoon rushes. You cannot put the traffic on Clark street, it is too narrow, nor Michigan Ave or any inner loop street, all full of traffic. The folks that are concerned about the money should remember that 2 years ago NYC spent 4.5 billion on the second Ave subway that transported 60,000 people each day in 2017. That is only paid for by the state. I-81 has 96,000 people travel on it every day and the project will have a significant portion of federal funding! When will CNY realize that we have been paying taxes for many many years and it’s time for the state to make an infrastructure investment in our communities. We are NOT second class citizens. Onondaga county hasn’t seen any growth in over 30 years (same population). It can’t afford to make decisions that will damage businesses and increase unemployment. I-980 provides a direct link from Walnut Creek to Alameda (without having to be impacted by SF-bound traffic) instead of taking 580-W towards SF to connect back to 880S through Oakland. Taking 980 saves over 20 minutes by not being stuck with those heading to SF. That’s always the question, isn’t it? And yet the traffic evaporates every single time. Sorcery! I live in the feeder neighborhood of the north side, and I can tell you that the roads feeding LSD are disastrous and dangerous—thinning, transforming, or just outright removing LSD would be a huge boon to my neighborhood in air quality, human safety, economy, and property values. A relentless stream of aggressive, inattentive suburbanites does us no favors. No worries. Yes, 980 is gold, and its not going away. Just CNU bi-annual ranting. Much as I am anti-highway, 980 was very useful when the Nimitz pancaked in 89 (Loma Prieta) And when the Bay rises, some of 580/80 may well be under water. Ummm … Second Ave. Phase I has 160K riders/day at least, and is projected to have 200K riders/day. That’s not what this says. Where’s your data from? 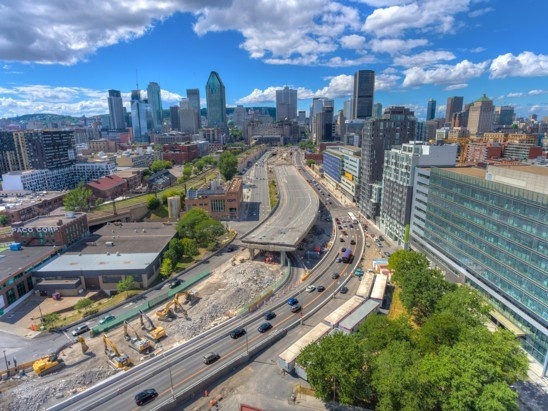 Bonaventure in Montreal is a nice recent example of highway-to-boulevard conversion. I-980 in Oakland made the list again? Snooze. It’s already a sunken freeway. The street grid is almost complete above it. Just build a couple more bridges and add a park deck like they did with the 15 in San Diego and call it a day. If we tear out 980, we’ll have to figure out where to put BART at the northern end, find a bunch of dirt to fill in the hole, reconstruct the MacArthur Maze to accommodate all the displaced traffic, etc. And all that will do will speed up the gentrification of West Oakland, so we’ll have to listen to advocates complain about that incessantly for years to come. There’s just no making some people happy. I don’t care if it gets torn out as long as they fix the MacArthur Maze at the same time, personally, but the thought of activists whining about gentrification is almost enough to change my mind. Why should Oakland residents be bothered by the white flight suburban commuters polluting their city? Take BART. I-5 in Portland? Curious to hear what the plan is for that. It’s the north south west coast interstate. Turning it into a street won’t be feasible since that wouldn’t allow it to continue functioning as an interstate highway. Fleeing crime isn’t a racial thing it’s a survival tactic. The Minnesota Freeway was originally where Minnesota Avenue ran between Montana and Missouri Avenues. That specific route through a dense, predominantly black neighborhood was no mistake on the part of planners at the time, but a deliberate attempt at breaking the neighborhood (not that much has changed since then, with people on the Westside Mainline MAX (currently served by Red and Blue) opposing the Interstate Avenue Mainline (Yellow) because of crime concerns). I 205 could take over as I 5; I 84’s route extended south to where I 5 and 205 meet in Oregon; I 405 renumbered as 284 and extended down the short segment of the Eastbank Freeway between the Freemont Bridge and Banfield Freeway; and possibly a rebuilt Minnesota Avenue inheireting Minnesota Freeaway’s State Highway 1 designation and either becoming State Route 1 (to remain consistent with their post ~2006 route numbering scheme) or State Route 99C (to stay consistent with State Highway 1W and 1E’s route numbers 99W and 99E in Portland). All of these freeway removals sound great except for Interstate 275 since it is the main connection from North of Tampa to Saint Petersburg. I think we should put Interstate 275 from Baeres Avenue to Himes Avenue and Interstate 4 from U.S. 41 to Malfunction Junction Underground while boulevards are placed on top of them. Malfunction junction will be completely underground with a roundabout intersection connecting the two boulevards are on top. This is more expensive than the other options but will restore more neighborhoods than tearing down the interstate while getting rid of traffic jams for good. The main Tampa collector & arterial streets that would substitute for I-275 travel are incredibly slower by comparison. Look for MUCH longer and more frustrating travel times. Well, the 2 in 275 already indicates it’s a redundant route of I 75. No, it is a spur that takes you down the west side of the overall Tampa area to downtown Tampa, the Tampa airport, St. Petersburg, other cities on the west side of Tampa Bay, and then back to I-75. See a map, and note I have visited the area for the last four years in a row. Well, the “2” at the beginning means it’s a bypass route, that’s how the interstate numbering scheme works. If it was a spur, that first digit would be a 1, 3, 5, 7 or 9. Just look at the map. I-75 does NOT go to downtown Tampa or St. Petersburg & nearby places west of Tampa Bay, I-275 does. Reality counts. I-275 is a critical part of the area’s highways. It is redundant about nothing. It’s not a spur, but it’s also not a bypass. The numbering of I-275 and I-75 is opposite to the normal convention; I-75 is the bypass around the urban area and I-275 is the route that goes into the urban cores of Tampa and St. Pete. This is because I-75 is the shorter, more direct route with more capacity for through traffic. The unsigned “hidden” state road designation for I-75 is SR 93, except in the Tampa area where SR 93 follows I-275 and I-75 becomes SR 93A, reflecting the fact that I-75/SR 93A is the actual bypass. Originally, the southern terminus of I-75 was in Tampa, at what is now the junction of 275 and I-4. I-4 continued west from Tampa over the Howard Frankland Bridge into St. Petersburg. The state originally planned to build a toll road connecting Tampa to Naples parallel to the Tamiami Trail, which would rejoin the trail to cross the Everglades to the east coast, but then the Feds decided to authorize an extension of I-75 from Tampa along a similar route toward Miami so the state dumped the turnpike planes. Instead, they decided to truncate I-4 at the Tampa junction and run the new I-75 extension from the junction along the former western end of I-4 through St. Pete, then over the Sunshine Skyway Bridge (which at the time only carried US 19), then south along the coast. Alligator Alley had just been completed, so the proposed cross-glades route was moved from Tamiami Trail to the Alley. At the same time, the state planned a bypass route around Tampa and St. Pete from Wesley Chapel to Ellenton, to be called I-75 East. During construction, the state realized that the eastern bypass was the more natural direct route and the urban route the more natural loop, and AASHTO had begun to discourage suffixed Interstate numberings, so the state gave the bypass the primary numbering and gave the urban route a three-digit loop numbering. Giving the primary numbering to the shorter bypass route also gave the state 5 extra miles of authorized Interstate mileage, so they upgraded North Bay Drive and South Bay Drive to Interstate standards and designated them I-375 and I-175. These were originally two small spur parkways from 275 connecting to either side of the St. Pete downtown core, and were meant to be the beginning of a network of freeways around Pinellas County that was mostly cancelled. I live near Portland; the stretch of I5 whose removal has been discussed for some time is the stretch through downtown that parallels I405, which would simply be renamed. Traffic might slow down some but, trust me, as someone who has driven the downtown PDX area a lot, nobody will miss that too-narrow pothole fest of a road or a couple of hairy, narrow, obsolete ramps that could be replaced in the process. I think it would be one of those rare things that improves life for drivers and humans both. If that’s the way you feel do something about removing 980. You probably feel the same way about all freeways. I-70 in Denver? Since there is not a east-west highway to carry the local and interstate traffic within 20 miles of it, it would add 45-60 minutes to the east/west traverse of Denver. That would drive up the air pollution in an already impacted front range. Not sure that is a fair tradeoff for the rest of the state of Colorado. don’t care about all human flourishing. Their ideology trumps the public good. claim that they give up driving. If you actually read the link it is talking about I70 in Swansea, the I76 runs parallel no further than three miles away at the furthest point. PS demolishing highways reduces pollution. People choose not to drive when highways are demolished. “If we tear out 980, we’ll have to … reconstruct the MacArthur Maze to accommodate all the displaced ” Or you could just let it disappear. Fine, then pay a toll for it. Don’t expect a public subsidy like you currently receive. Like the other suggestion the onus is on you to get people to pay that toll. If I don’t like someone smoking in a public space I don’t tell them you can’t smoke. There’s zero reason to have two parallel interstate lines run the same direction. Simply take down 70 through central Denver and have it reroute through the existing 270/76 leg. Saves maintenance costs, reconnects most of central-north Denver, and reduces the pollution of running two interstates. I-5 and 205 serve two different strings of suburbs when south of the Columbia river. An idea that strikes me is for the whole stretch of 5 that parallels 205 to have an HOV lane, from Tualatin to LaCenter. Try to nudge as much through traffic onto 205 as possible, to keep max local traffic on 5. It would still be a great idea to remove the part of I5 that runs along the Wilammette river in downtown Portland. In that area, 405 just plain works better. And, for heavens’ sake get light rail into VANCOUVER WA no matter what the whining hicks in north Clark County think! Traffic from both highways, running on one remaining highway, will cause major slowdowns, and thus increase air pollution. Not sure how this benefits anyone. Additionally all of the traffic that becomes southbound, on I-25 or on surface streets, will clogs those roadways. Anything that slows down traffic (for autos, commercial vehicles, ride shares, or buses) increases air pollution. The number of cars sitting in traffic isn’t going to magically double out of nowhere. The name number of people will still try to get to work, regardless. The one outcome that might come of this is some folks might get frustrated enough to ditch the car commute (we are guilty of taking the path of least resistance, after all), and seek alternative methods like a bike, bus, or train…or some combination thereof. On a smaller note, those cars that do continue to punish themselves in the morning commute will no longer be spewing fumes right in the middle of downtown Denver. Ok, fine, we won’t demolish anything, we just won’t maintain it using public money. The onus is on you to demonstrate that ongoing expenditure is worthwhile. I’m not sure it’s a fair trade off that Denver taxes subsidize the rest of the state,. I 205 and 5 don’t serve Portland, they serve traffic going through it, not to it. Just like every other interstate. Entirely the reason why it was originally envisoned to not go into cities in the first place. The bad old days -- when we torn down urban neighborhoods to build highways -- aren't really behind us.